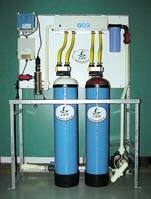 IBC Water offers a range of portable rental/exchange deionisers (D.I.) to suit most commercial/industrial applications. Exhausted D.I. cylinders are exchanged for fully regenerated D.I. cylinders and are regenerated at the IBC Water factory. In a competitive business environment, any possible means of cost reduction must be explored. IBC Water's exchange service deionisers provide an economical solution without sacrificing quality.